While reading the complete works of William Shakespeare, I commented about him and his works on my Facebook wall. These posts are from May and June of 2013. 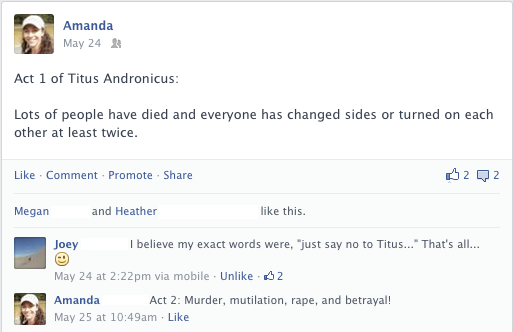 Now, you will see why I was warned away from Titus Andronicus! 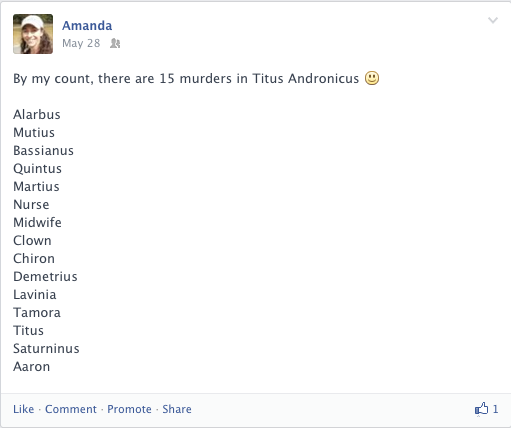 Reading Titus Andronicus got me thinking suspiciously. This entry was posted in Shakespeare on Facebook and tagged Complete Works, Pericles Prince of Tyre, Shakespeare on Facebook, Titus Andronicus, William Shakespeare by tarvasalutes. Bookmark the permalink.